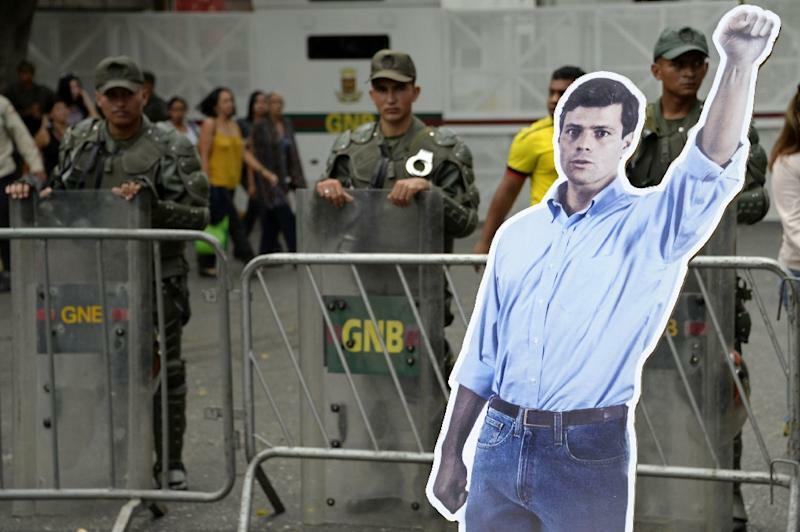 Caracas (AFP) - Venezuela's opposition is seeking to oust President Nicolas Maduro by mid-2016, jailed dissident Leopoldo Lopez said Tuesday as the country headed toward legislative elections that the ruling socialists risk losing. "This can't wait until the presidential elections in 2019," Lopez said in a message datelined from his prison cell and posted to a Twitter account managed by his wife. "Political change has a date in Venezuela and it is the first half of 2016." The 44-year-old opposition leader said that if Maduro did not resign, his movement would seek to remove the president from office with a referendum or by changing the constitution. Under Venezuelan law, elected officials can be recalled by referendum halfway through their terms -- a milestone Maduro will reach in April. With the South American oil giant mired in economic crisis and Maduro's popularity plummeting, political analysts have speculated the fractured opposition could use a strong showing in the December 6 legislative vote to channel momentum toward a recall referendum. Polls show the opposition leading by 14 to 31 percentage points heading into the elections, meaning Maduro's movement risks losing the National Assembly for the first time since his late mentor Hugo Chavez came to power in 1999. Lopez said the opposition Democratic Unity Roundtable (MUD) had agreed back in July to hold a "deep discussion on which mechanism to use to bring about change." The first goal is to win the National Assembly, he said, calling on supporters to "go out and defend those votes peacefully." Lopez, the Harvard-educated leader of the Popular Will party, was sentenced in September to nearly 14 years in prison on charges of inciting anti-government protests last year that left 43 people dead. The ruling was strongly condemned by the United Nations, the United States and the European Union.